The Modern Workplace: Are You Ready for the New Hours-of-Service Regulations for Drivers of Commercial Motor Vehicles? Are You Ready for the New Hours-of-Service Regulations for Drivers of Commercial Motor Vehicles? 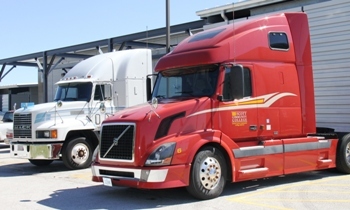 As of July 1, 2013, the Federal Motor Carrier Safety Administration’s Hours-of-Service Regulations relating to drivers of a commercial motor vehicle (“CMV”) are changing. These changes require some significant advance planning for employers of those who drive a CMV. Who is affected by these new rules? What are the main changes beginning July 1? · 30 Minute Rest Break: Under the regulations, the driver of a CMV will not be permitted to drive if more than 8 consecutive hours have passed since the end of the driver’s last rest break of 30 consecutive minutes. The regulations do not specify when the 30 minute rest break is required within the 8 hour window. During the rest break the driver is not permitted to perform any duties related to the job. For drivers operating a truck with a sleeper berth, the 30 minute rest break can be taken in the sleeper berth. Drivers who use log books are required to record the 30 minute rest break as off duty. The 30 minute rest period does not extend the maximum duty day of 14 hours. As a result, the on duty day is shortened to 13 and 1/2 hours. Maximum drive time remains 11 hours per day which leaves 2 and 1/2 hours of non-driving work time. · Reduction of Hours a Driver Can Log in a 7-Day Period: The current rule allows a driver to work up to his or her 60 or 70 hour limit, take a 34-hour restart break, then drive again. The current regulation allowed drivers to accumulate 82 working hours in a 7-day period. Under the new rule, the maximum number of hours a driver can work and drive is limited to 70 hours per week. A restart break must now include two back-to-back nighttime periods of rest from 1:00 a.m. to 5:00 a.m., which may force some drivers to be off duty for more than 34 hours. In addition, the driver may only use the restart option once in any 168-hour period (7-days). Under the new regulation, a driver cannot start another restart break until 168 hours have passed since the start of his or her last restart break. The new regulations will have a big impact on the number of hours that commercial drivers will be allowed to drive. It is important for employers to understand the new regulations well before July 1 in order to plan for the changes that will impact their businesses. Summary charts of the changes to the regulations can be found at the FMCS’s website found here.